The snow is flying and sticking to the ground finally, this makes some dream of skiing, boarding and Christmas. For me all I can think of is how to stay warm, I hate being cold. At night I sleep with two duvets, two quilts and alternate my dog and husband for body heat. I am constantly wrapped in a big pink fluffy robe, a blanket and sipping a hot drink. You would never guess that I used to be a figure skater by the amount I hate being cold. So I decided to research the best and most stylish way for me to keep warm during a long Canadian winter. Originally I had my heart set on a Canada Goose coat, but them someone directed me toward Nobis, also a Canadian company. I absolutely fell in love with the "Tula" and trenchy in appearance winter coat. I love the collar and detachable down filled hood, bonus is that my bum would be covered (nothing worst than a cold tushie). Although there isn't a retailer in London, I think it would be worth the drive to Toronto to obtain one of these beauties. I have also be in love with Boggs Boots for ever, I am going to own a pair by the end of the winter. 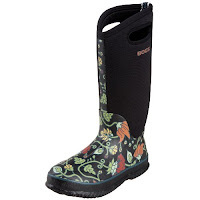 I love the look of a classic rain boot, makes me want to jump in puddles. These puppies are stylish and keep your toes warn down to minus 40 degrees celcius. I'm defiantly a cuddle bug, and love to bundle up this time of year. Great idea... the Canada Goose trend has taken over to such a great extent that hanging around North Toronto you'd forget there exists any other brand of coat... I get wanting to be warm though... I'm all over the down 3/4 length!